Here are the different types of hotels available for booking in the UK and what to expect from each of them. If you are buying your ticket on the Ukrailways and thinking of booking a hotel in the UK, here is the guide you need. Most UK hotels no longer have that 'Fawlty Towers' style management. Nonetheless many are very individualistic. Some hotels are part of a chain, some are privately owned and operate only in the UK. The following are specific examples of types of hotels you can book into and what you expect to find. The traditional UK hotels, like hotels in many other countries and places, are purpose built or adapted buildings with well fitted rooms. They may have single or double or executive beds for the night. They traditionally come with facilities including telephone, Wi-Fi, TV, Satellite TV subscriptions, tea kettle, tea cup, tea, coffee, biscuit, ironing board, and reading table. Depending on the degree of luxury facility, they can be 1 star, 2 star, 3 star, 4 star or 5 star hotel, with 1 star offering the most basic of room size and facilities, while 5 star traditional hotels offer the top of the range luxury facilities. The cost of booking such hotels range from £55 to £1200 per night, depending on their location, level of luxury afforded and star rating. 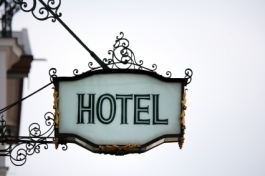 The average cost of booking an hotel in the UK is currently £60 per night. Bed and breakfast hotels are a very popular hotel type in the UK. These are often a large single family home with extra bed rooms rented out to lodgers on a nightly basis. They provide the most basic of facilities with breakfast included. They are one of the cheapest form of accommodations you can get in the UK tourism industry, perhaps after a hostel. The cost of booking a bed and breakfast hotel accommodation in the UK is currently between £30 to £55 per night, depending on location and facilities provided. Hostel hotels are hotels with very basic budget accommodations that provide only bed spaces for users. It often has bunk beds, accommodating several numbers of lodgers in a big commonly shared room, shared toilet, bathroom and kitchen. You can get a hostel hotel in the UK from as little as £10 per night. You can search and book a hostel in the UK or indeed across many cities round the world here now. Bijou hotels are usually very small, with only a few bedrooms and are often located in country house type accommodation with a fine dining restaurant as well. They cater for people who often want very quiet and peaceful surroundings and are generally very laid back. Book a Hotel in the UK country side and enjoy true hospitality in a Bijou Hotel. Seaside hotels are often quite traditional, with dinner served between 7 – 8 pm and breakfast between 7.30 and 9 am. They are not different from the traditional English types of hotels, only in location and services adapted to provide for seaside living. Some provide entertainment for guests and there is very much an emphasis on having a jolly time at the seaside (whatever the weather). If you are looking for a quick weekend get away with your spouse of mate to the UK, this is one of the types of hotels you should look to book in. Spa hotels are equipped to offer pampering massage treatments and beauty therapies for clients. They tend to be in the country, or near the country and offer perfect 'get away from it all' pampering breaks. Historic hotels, as the name suggests are located in old, mansion type houses, where you can really feel as if you have stepped back in time and entered another era. Some of them may (or may not) have ghostly goings on, so if the supernatural is your thing, then you may want to look for a very historic setting for your stay when you book a hotel in the UK. These are another types of hotels in the UK. Resorts are big size hotels often in a large piece of land, providing self contained accommodation, swimming facilities, food, drinks, sports facilities and every other facilities required for a total relaxation and vacationing. It is often rated within the 3, 4 or 5 star category in terms of facilities. We hope you find the type of hotel to suit your journey or vacationing in the UK. UK Hotel Reviews: Have Your Say! Did you book a hotel in the UK recently? Did you have a great experience with your booking process and stay, or not so great? We would love to hear from you. Share it! If you are looking to book a hotel in the UK too and want some help, let us know. We may be able to help. Post your thoughts, comments and concerns here.